Malaria Wiped Out In U.S. But Still Plagues U.S. Hospitals : Goats and Soda Transmission was eliminated in the United States in the early 1950s. But a new report sees a surprising trend. 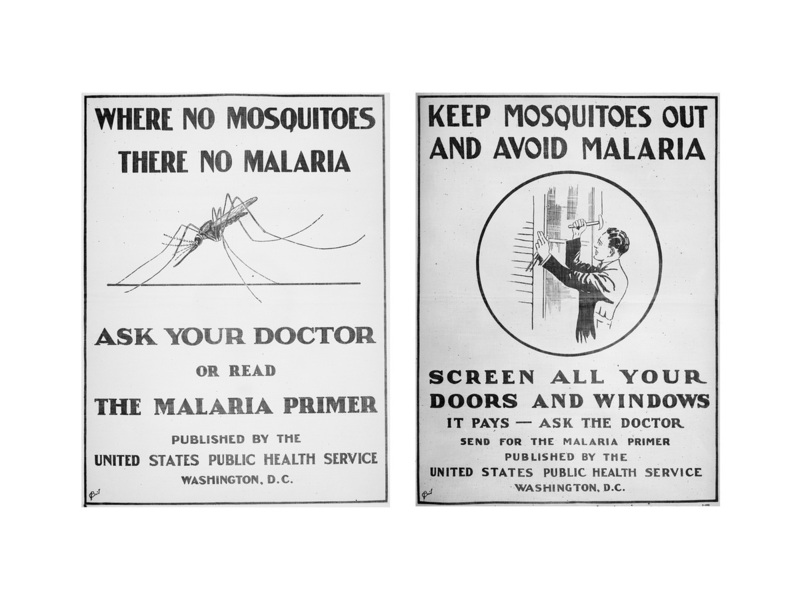 Posters from the U.S. Public Health Service issued in 1920. Malaria transmission in the United States was eliminated in the early 1950s through the use of insecticides, drainage ditches and the incredible power of window screens. But the mosquito-borne disease has staged a comeback in American hospitals as travelers return from parts of the world where malaria runs rampant. In the early 1970s there only a couple hundred malaria cases reported in the entire U.S. but that number has steadily increased in recent years. A new study published in the American Journal of Tropical Medicine and Hygiene finds that now roughly 1,500 people are hospitalized each year in the U.S. with malaria. "We don't know of any active transmission in the U.S. so we assume that these cases are all travelers or immigrants," says Diana Khuu, an epidemiologist from the University of California, Los Angeles. Khuu and her colleagues analyzed national hospital admissions data from the years 2000 to 2014 and found far more malaria than they expected. "Definitely the numbers are so high," Khuu says, for a disease that should be easily preventable. "We do have good anti-malaria medicine that travelers can take but apparently some people are just not using it." And the consequences of getting malaria can be devastating. Over the 14 years of data that Khuu analyzed there were a total of 22,029 hospitalizations for malaria nationwide. Nearly 5,000 of the cases were deemed "severe." and 182 were fatal. Most of the malaria admissions ran up hospital charges in excess of $25,000. "Malaria is still a health issue in the United States," says William Moss, a pediatrician and professor of epidemiology at the Johns Hopkins Bloomberg School of Public Health. "It is inevitable that we are going to see cases in the United States because [malaria] is such a major global problem and people are constantly moving from endemic areas in to the United States," he says. The World Health Organization estimates that there are more than 200 million cases of malaria occur globally each year, the vast majority in Africa. The new study found that the majority of those hospitalized were black men age 25 to 44. Moss says he suspects many of these patients are first or second generation immigrants who traveled back to Africa to visit friends and relatives.Part of the reason for resurgence, he says, could be a misunderstanding of immunity. In places where there's a lot of the disease, Moss explains, kids often develop immunity to severe malaria. So migrants, even if they left their native country years or decades ago, may assume that they don't have to worry. "That childhood immunity, however, is lost rather quickly," Moss says. "Individuals may think that they have some protection because they had malaria infections during childhood. And then they go back, they don't take the proper chemoprophylaxis [anti-malarial pills], and they're susceptible not only to infection but to the disease." Malaria is caused when an infected mosquito bites a person and then the malaria parasites start reproducing explosively inside the person's liver and blood. Symptoms usually take a week or two to appear but can be delayed for up to a month after the fateful mosquito bite. This gives travelers from the U.S. plenty of time to return home before potentially falling ill.
"The big problem is that these cases are occurring all across the United States," Moss at Hopkins says. He says many doctors, particularly in rural areas, might not consider that a patient who's come in with a fever has malaria. Even if they suspect malaria in someone who'd recently traveled, "they might not have access to proper diagnostics to test for it." And if they do end up diagnosing a patient as having malaria, treatment might be harder to arrange in Arkansas than in Angola. "Many smaller hospitals, even many larger hospitals, aren't going to stock anti-malarial drugs," Moss says. As long as there are hundreds of millions of cases in other parts of the world each year, Moss says, cases are going to turn up in American emergency rooms.